Experience the modern marvel of commercial jet production on this unique and one of a kind tour from Seattle to the Boeing Future of Flight Aviation Center. 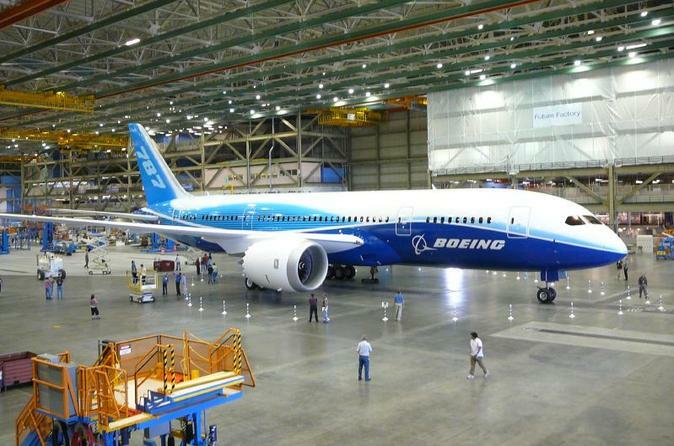 The Boeing assembly plant is home to legendary planes like the 747, 777 and the world’s most advanced jetliner, the 787 Dreamliner. You’ll have an opportunity to learn about Boeing’s long and storied history, go inside the world’s largest building to view airplanes in various stages of assembly, take photos overlooking Paine Field and the billions of dollars of Boeing product in different phases of completion and shop for official Boeing branded gifts. This tour package, provided by Show Me Seattle Tours, includes comfortable coach transport with a knowledgeable local guide to and from the Center, and admission to the 90 minute tour of the assembly plant tour led by expert Boeing staff. Book now for an experience unique to Seattle! The small-group Seattle Boeing Factory Tour starts when your professionally trained driver picks you up in a comfortable coach for the trip 35 miles north of Seattle to the Boeing Future of Flight Aviation Center. Once aboard, your driver will share some quirky and interesting facts about the Boeing, Seattle, and the Pacific Northwest. All drivers are happy to answer any of your questions, so ask away! Once you arrive at the Boeing factory, you will be escorted on an informative and fun 90 minute tour of the Boeing assembly plant, guided by expert Boeing staff. You'll see where Boeing's 747, 767, 777 and Dreamliner aircraft are manufactured in the largest building in the world by volume. On the Boeing flight line, you will see airplanes in various stages of flight test and manufacture for airline customers around the world. You'll also have an opportunity to take photos and do some "plane spotting" up on the Strato Deck, and visit the Aerospace Galler for interactive exhibits, a flight simulator, an advances Makerspace, and much more. Note that the tour involves a walk of one-third of a mile, and some steep stairs. Some wheelchairs available at the Future of Flight, please ask your Show Me Seattle guide. *Hotel pickup reservations are limited. If the hotel pick-up option is sold out, you will be asked to shift to the general pick-up spot.